The Dalmatian got his big fame trough the well-known Disney film. It is an impulsive dog that loves the exercise. This horse friend loves to be around horses and barns. 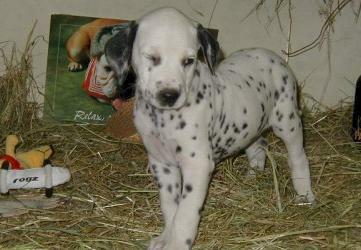 Because the Dalmatian is rather stubborn, it is necessary to give him a good education. Thanks to his friendly and sociable character, it is an excellent playmate for the entire family. His short coat doesn�t demand a lot of care. The ideal height varies between 56 and 61 cm.